Terry Marsh is a veteran of Madeira having spent over fifteen years writing about the island. 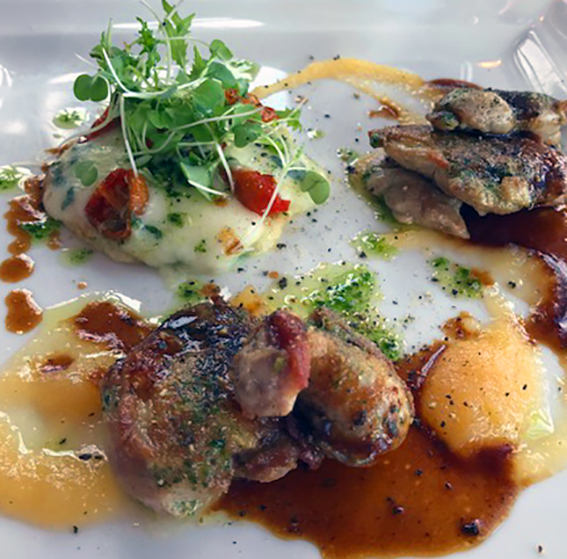 Here, he gives us an insider guide to his favourite restaurants and foods you can find on Madeira. My wife is sipping the daily cocktail – a Hardly Wallhanger, or something like that. Yesterday it was the Tequila Sunrise; tomorrow it will be a Pina Colada. Visits that span more than fifteen years in all, organising walking festivals and responding to the need to regularly update the Michelin Green Guide to Portugal, Madeira and the Azores have taught me a lot about the place. Talk to people about their first impressions of Madeira and it is only a matter of time before the conversation turns to food. For a volcanic, largely infertile island with waters 3,000 metres deep just a mile or so offshore, the range of produce on which to dine is somewhat limited…unless you pay for imported foodstuffs. All the cruise ship escapees head for the nearest place serving the black scabbard fish with Madeiran bananas – Espada – or the equally renowned beef kebabs – espetada – served with fried maize (milho frito). Both are equally delicious and filling, and not at all expensive. But fish abound, and you can eat cheaply on parrot fish, grouper, snapper, wrasse and a wealth of other fish most have probably never heard of. It’s the sensible way; not least because Madeiran hospitality serves it with a dish of boiled potatoes, vegetables, some salad and quite often chips and rice, too…all at the same time. You retreat to your hotel, pushing your stomach before you. 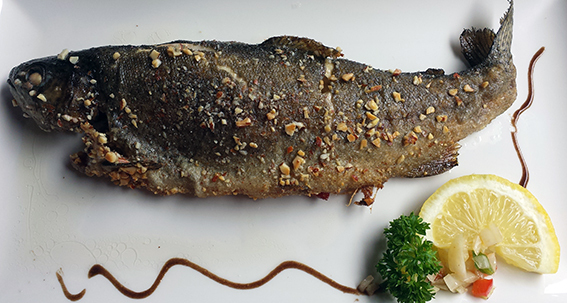 Try the Gaviao Nova on the Rua de Santa Maria in Funchal Old Town for a good range of fish dishes. In fact, the Old Town has a wealth of restaurants with front-of-stage touts encouraging you to dine with them…and sometimes that can be a little off-putting. Over the years I’ve dined at all of them, and there is little to choose between them; they all serve much the same menu at reasonable prices. Arsenio’s is reputed for its fado singing, which happens most evenings. So, you must decide whether you want to dine to the accompaniment of rather sad songs of unrequited love or eat elsewhere in peaceful contemplation. Lapas (lapash) you’d turn your nose up at home, but if you, and more to the point those with you, can live with the garlic afterburn, these rather chewy limpets are good as a starter; different, sure, as are the sardines as big as herring. Wash them down with a generous glass of the local vinho verde (green wine), a light, refreshing and rather delicious wine not dissimilar to the Italian Frascati, and you have a satisfying lunch. In a few places – you may have to ask at your restaurant – you can get cataplana, a seafood dish originating in the southern region of Portugal in Algarve, and about as traditional a Portuguese dish as you can get, although it is not traditionally Madeiran. 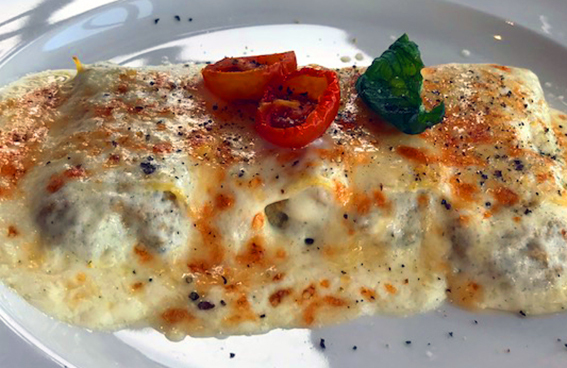 At many places, especially away from Funchal you will encounter more rustic dishes. Açorda is served in many seafood restaurants, a rice dish, not unlike a risotto served with lobster and a local meaty, white fish like grouper. But traditionally, açorda is a peasant, bread dish, a thin but tasty broth in which you have chunks of bread soaking it up; very filling. You’ll get that at The Restaurant Ribeiro Frio in… Ribeiro Frio, where you also get a chance to visit the trout farm, and maybe eat one or two. A short way down the road from Ribeiro a small cantina sits at a road bend. Tour coaches like to stop off here to let the incumbents stretch their legs and have a coffee before taking the short levada walk to Balcoes. But inside, at the back, is a small restaurant that will be happy to welcome you and dish up some truly local food. 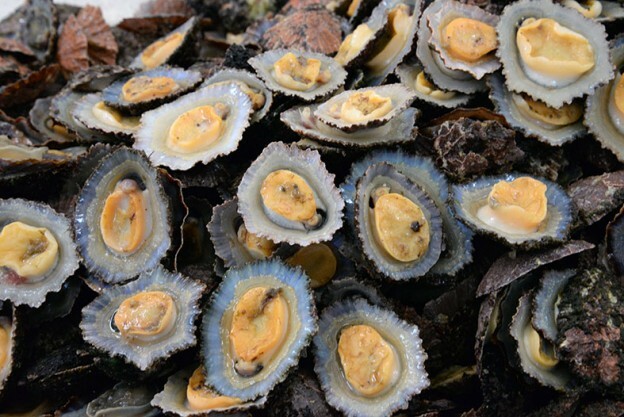 There’s an impressive range of seafood dishes in the Restaurante Praça do Engenho in Porta da Cruz well worth tracking down for a seaside lunch or evening meal. The walls of the restaurant are the original walls of the factory that once stood here, and on which the restaurant was built. The floor inside is made of the traditional “Calçada-Portugues”. The pavement outside is a traditional sidewalk Madeirense called ‘Calhão’. Almost everywhere, whatever you order, you get a side plate of garlic bread, bolo de caco. You may not have ordered it, but it comes anyway, and only costs a euro or two, but after a week or so you may develop a resistance to it…it is rather filling. 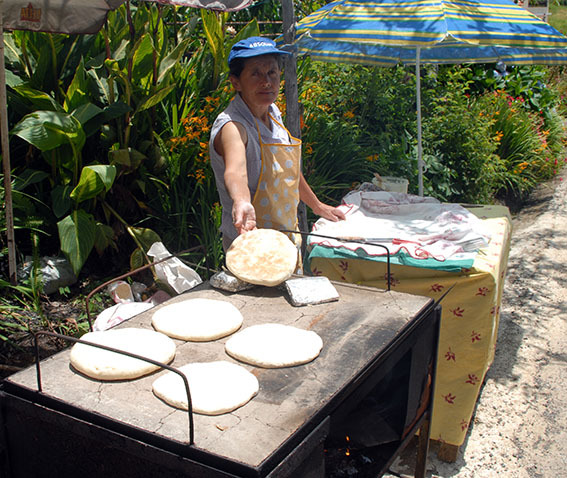 Along the south-west coast, outside one of the small hillside villages a lady can often be found making fresh, garlic-butter-lashed bolo de caco; it tends to make a mess of your arms and hands, but it doesn’t come any more freshly made than this. There is no shortage of restaurants across the whole of Madeira, but in the up-market end of dining, the new kid on the block is Il Vivaldi on the front in Funchal, although they do need to realise that Vivaldi wrote more than the Four Seasons! Vila Cipriani, part of the Reid’s Hotel complex, dishes up a combination of Italian and French cuisine with an excellent wine list. 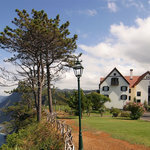 Reid’s Hotel itself has one of only two Michelin-starred restaurants on Madeira, although others are knocking at the door. 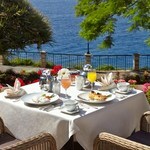 William Restaurant is housed in Reid’s Hotel, and offers not only fine dining but fine sea views, too. The other Michelin-starred restaurant is the Il Gallo d’Oro in the Cliff Bay Hotel, which gained its second star in 2017. Elsewhere a satisfying evening can be had in the fort at the far end of Old Funchal – Restaurant do Forte – while the nearby Riso Restaurant overhangs the sea and serves dishes all of which contain rice in one form or another. This Risottoria del Mundo, provides a selection of rice dishes from distant places, blending different basic strains of rice with high-quality ingredients to produce novel main dishes or accompaniments to conventional ones. Of course, if there must be a downside to eating in Madeira it’s the pasteis do nata, a custard-filled flaky pastry tartlet; very tasty, and very more-ish. They even sell them gift-boxed at the airport; tempting to the end. Think of it as counter-balancing all that fish. They say they are calorie-free, but they lie. Tell me more about this insider guide to Madeira’s restaurants. Restaurante Villa Cipriani, Estrada Monumental 143, Funchal. Tel: +351 291 717 171. Il Vivaldi, R. Conselheiro José Silvestre Ribeiro 2, 9000-052 Funchal. Tel: +351 291 145 550. 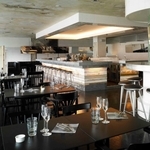 Restaurante Riso – Risottoria Del Mundo, Rua de Santa Maria 274, 9050-040 Funchal. Tel: +351 291 280 360. Arsenio’s, Rua de Santa Maria 169, 9060-291 Funchal. Tel: +351 291 224 007. Restaurante Do Forte, Tv. do Forte 3, 9060-123 Funchal. Tel: +351 291 215 580.